CHIPATA, Zimbabwe, May 21 2012 (IPS) - Climate change may have led to declining water levels in Genda Village in Zambia’s Eastern Province, but Mercy Mwanza and the women here discovered there was a positive side to it and found a new way to earn a living. Decreasing water levels in the local Lunkhwakwa River have created an opportunity for Mwanza and the other enterprising women of Genda and surrounding areas to get involved in fishing – something that they were previously too scared to do. Mwanza told IPS that the village, which is located seven kilometres southeast of Chipata, the capital of Zambia’s Eastern Province, used to receive heavy rainfall. As a result the Lunkhwakwa, which also supplies the local water utility, was in flood most of the time, and the women here were too afraid to go near it. “In the past, we could not go fishing like we are doing now. There was too much water in the river. But these days the water level is always very low, making it very easy for us to venture into the water and catch our fish,” Mwanza said. The past five years has seen the once-mighty Lunkhwakwa River reduced to a small stream of water. According to the Chipata District Environmental Assessment Report, the area has received low rainfall since 2009 because of climate change. The situation has been further compounded by pollution, encroachment and rampant erosion – which resulted in siltation around the river. So when water levels in the river started declining last year, Mwanza, a single mother of three, was among the first women to start fishing. And this year, more women have joined her. “This is the second year I have been fishing, but other women only started this year,” she proudly told IPS as she cleaned the breams she caught that morning. She and the other women here catch fish by lowering baskets into the river and waiting for the fish to become trapped in them. 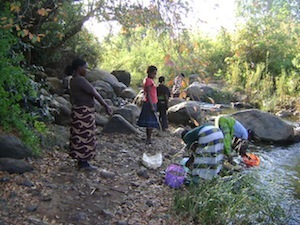 The Lukhwankwa River has become the place to be for most women from Genda. In the early morning, when the water levels are low, you will see eight to 10 women lowering their baskets into the slow-flowing current of water. “It’s easy, but time consuming. And you need patience in order to have a good catch in your basket,” said Misozi Zulu, a Grade 9 pupil at Genda Basic School as she lowered her baskets into the river. Afterwards the women take their catch to the market in Mchini compound, in Chipata. The women either walk there or they pay 30 cents for bicycle rides, which are undoubtedly the most popular means of local transport here. “I feel happy when it does not rain heavily because I know that I will be able to make some money from fishing,” Zulu told IPS. Previously the occupants of Genda were reliant on small scale farming to earn a living. Villagers used to reap bumper harvests of maize, but with the declining rainfall, maize yields have dropped with each passing year. And for the women of Genda, basket fishing is becoming a new reliable source of income. They are also assured of a constant supply of protein in their homes. “As for us women, we can only fish when the river is like this and for us it’s good for now. This climate change is giving us something to better our lives,” said Bessy, another fisherwoman, who did not give her last name. The income earned from fishing has enabled Mwanza and a few other women to open small tuck shops, known in Zambia as kantemba. The combined income from this and from fishing has enabled them to attain some financial independence. They are able to pay their expenses and cater for their children’s needs, including sending them to school. Education in Zambia is not free, despite calls for the government to provide free primary school education and subsidise tertiary education. “My husband is a fisherman and he has been fishing for more than 10 years, but he has never given me any money. Since I started fishing, I am now able to do what I want with the money I earn from selling fish,” Bessy said. The local headman, 58–year-old George Mphanza, said that he was happy to see women engaged in fishing, even if it was on a small scale. He said being able to earn an income has affected the quality of the women’s lives. “Half a loaf of bread is better than none, so this is good. You know, most men in this area are fishermen, but they are drunkards and they are failing to better their own lives. But with these women, I have seen a change,” said Mphanza. But many here are fully aware that this source of income is not sustainable, as one day the river may dry up and fish will disappear. James Phiri, the headmaster at a local school, is concerned too. “I came to this area seven years ago and we never used to cross this river during the rainy season, even using the bridge. There was always too much water. This is not good because in the next three to four years, this river will be no more,” he said.